How to run a bootable partition manager from USB? AOMEI Partition Assistant can help you figure this out. It also allows users to resize partition with bootable CD and many other wonderful features. To many people, they don’t have custom to make bootable partition backup. But, if hard drive has crash, is infected with virus, or will simply not boot up for reason unknown, they would be so anxious and scared. If computer can’t be booted, it means that all data and files can’t be read, not even mention to cope with something with computer. “How to make bootable partition USB?”, “How to run bootable partition manager from USB?” These question can be found in forum every second day. Some people always trust luck that some accidents can’t happen to them. Once it happened, they have to seek for help that publish posts in forum or find answers in other posts’ comments. But to most users who caught in bootable partition crash, the final way to solve these questions is to send computer to repair shop, and they have to pay a lot of money and plenty time. When computer stays away from its owner and send to professional repair, it is very hard to say security of computer data ad files. For safe of bootable partition, it is a good way to create a bootable CD, which is not only a kind of backup type, but also a secured measure. If your computer can’t be booted suddenly, you can try to boot computer with the booted CD you have made. And then you can repair what went wrong. First, you have to know what bootable CD is. A bootable CD or DVD is build up according to the El Torito standard. This means that the ISO9660 File System has an extension which provides information to BIOS so that the BIOS knows where to boot from and what files to load from where. Bootable CDs or DVDs are a BIOS thing, once the OS is up and running the bootable structures are ignored. Bootable CD-ROMs allow you to boot and run a run-time image from a CD-ROM. Using the El Torito Bootable CD-ROM specification, a single CD-ROM image can be duplicated and used across many target systems. Running the operating system (OS) from read-only media also protects the integrity of the file system from potential corruption. As mentioned above, to many common users, it is very complicated to understand. If you are IT professional, maybe it is a good choice that to create bootable CD-ROM with the third-party software. Of all kinds of software that can create bootable CD-ROM, AOMEI Partition Assistant is one of the best choices for make a bootable USB. As an excellent partition toolkit, it owns the feature of creating bootable CD wizard which allows you to create bootable CD or USB flash drive in a few clicks only. Sometimes you may encounter the situation that the operating system fails to boot for some reasons, thus create a bootable CD based on Windows PE might be the best way to fix this problem. Once we have create a bootable CD or USB flash drive, we can boot the operation system from flash drive. There is a guide that makes a bootable WinPE media with AOMEI Partition Assistant. Step1: Install and launchAOMEI Partition Assistant Pro Edition. Click "Make Bootable CD Wizard" in the left panel, and then click "Next" to continue. 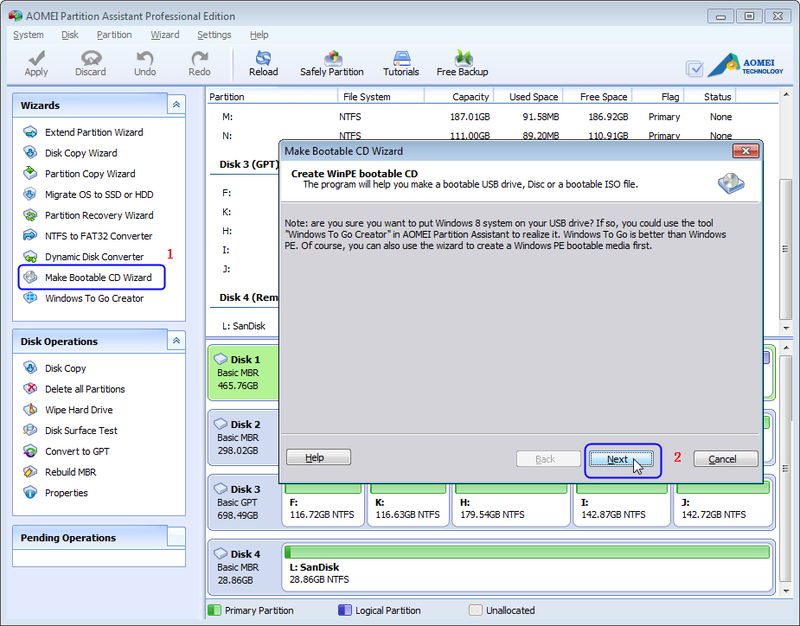 Step2: AOMEI Partition Assistant will automatically detect whether your system has installed Windows AIK or not. If yes, please go to Step3, if not, please download and install Windows AIK. Step3: There are three ways to create bootable media based on Windows PE. Choose one of them according to your need and click "Proceed". Here we take USB flash drive for example. Step4: The USB flash drive needs to be formatted. If there is important data on it, please make a backup and redo. For more accurate process, please visit How to Create Windows PE Bootable USB or CD with AOMEI Partition Assistant? 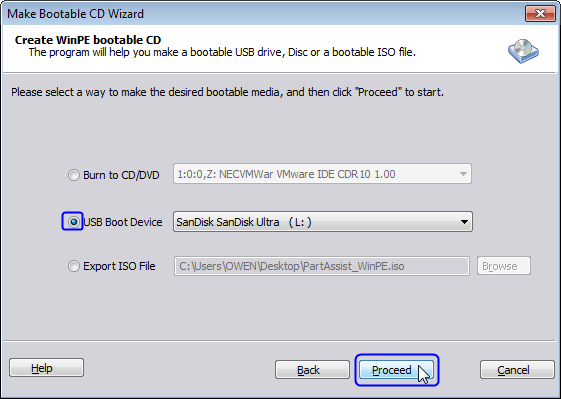 After you finish the process, you should know how to run bootable CD from USB. To boot from the Windows PE USB flash drive or CD/DVD, you need to enter BIOS and change boot order under Boot Menu.